Here’s an interesting project that you can do with plasma TVs, a Wiimote, an iPhone, and some sort of computer of some sort. After all, all of us want some sort of house with a terrific view. 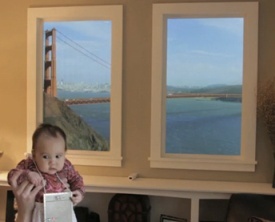 The example that you see in the picture is of the Golden Gate bridge, but what makes it different than say, posters, is that you can walk around this thing and it will look like you’re walking around a real window with the real view. There is a video of it after the jump if you want to see it work. The plasma TV sets that provide the view have a computer behind them that are synced with a Wiimote that you can see in between the plasmas. This Wiimote can be synced with another smaller computer that you can see on a baby in the video. When this small computer is moved around, it will change the view of the windows. By the way, you can change the views to pretty much anything you want. So if you want to see a shark tank, you can do that. However, you have to have the footage adjusted so it will adjust with the set-up here. All in all, I could use one of those things. All I got for a view of my place is my neighbor’s place, and it doesn’t look as pretty as the Golden Gate bridge. Now this is a good use of technology. I’d love to have a house under the sea like Sponge Bob lmao!